TERROR BROADCAST ON UTV!!!!!!! | AMERICAPHILE RESURGENT!!! ← SAN FRAN NAN EXPOSED AS A SATANIST PRIESTESS!!!!!! The DUP has accused the [MÄNNYSTÈR O LEAR]of wasting money on a new television advertisement broadcast solely in [THE LEPRECHAUN LANGUAGE]. The ‘Get Involved’ advert aired during the UTV news at 5.45pm, and was swiftly condemned by East Londonderry MP Gregory Campbell. 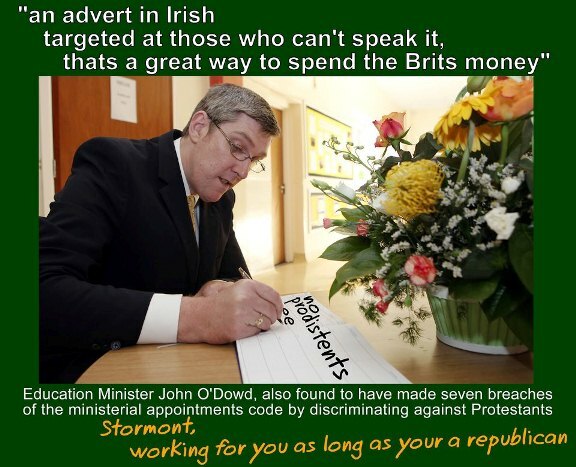 Mr Campbell said the Sinn Fein[/IRA] [MÄNNYSTÈR], John O’Dowd, was “potentially acting illegally” and was more concerned with a party political agenda than the education of young people…. ….Meanwhile, at a Belfast City Council meeting last night the DUP failed in its attempt to prevent the erection of a ‘Nollaig Shona Duit’ [BWAHAHAHAH!!!!!!] sign being erected in the grounds of City Hall again this year. THIS IS THE BITTER FRUIT OF JIM ALLISTER’S GROVELING APOLOGY TO GURU MAGGOTS!!!!! PRO-FREEDOM, ANTI-TERROR ACTIVIST WILLE FRAZER IS URGING ULSTERMEN AND WOMEN TO CALL UTV DIRECTLY AT 028 9032 8122 AND THE ADVERTISING STANDARDS AUTHORITY 020 7492 2222 ONLINE BY CLICKING HERE!!!!!! Pingback: CENTENARY OF FREEDOM!!!!!!!! « AMERICAPHILE RESURGENT!!! Pingback: UK COMMITS COLLECTIVE SUICIDE!!!!! « AMERICAPHILE RESURGENT!! !